Only a third of EV owners follow best practice guidelines of checking tyre pressures at least once a month. The remainder are likely to experience reduced range on full charge, reduced energy economy (km/kWh) while driving and increased tyre wear. In extreme cases, driving safety may be compromised. Low rolling resistance tyres will extend range. There is a need for effective educational campaigns to improve tyre care practices amongst both EV and Internal Combustion Vehicle owners in New Zealand. 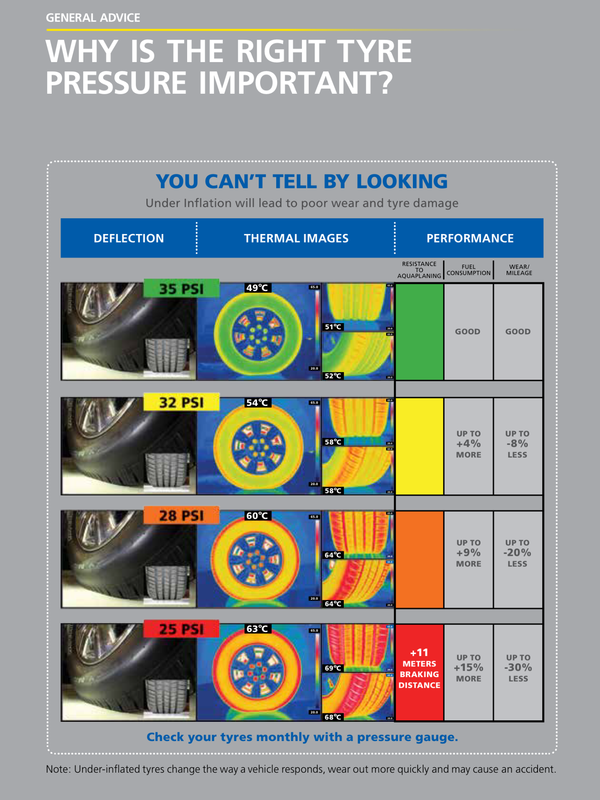 We wanted to collect information on what tyres are currently out there, how often their inflation pressure is checked and adjusted, and what drives tyre replacement choices. Our aim was to help make your tyre decisions easier when it’s time to replace, and to share some hot tips on best pressure practice to delay that need for replacement as long as possible. “Compared to your current/previous Internal Combustion Vehicle, has your frequency of checking tyre pressures changed? And if yes, how? The poll was sent to 889 participants in Flip the Fleet on 25 May 2018. We received 512 responses by 13 July 2018 and 368 of them included detailed comments and answers to at least one of the five supplementary questions. Figure 1. Frequency of checking tyre pressure by electric vehicle owners. The percentages were calculated from 512 responses from throughout New Zealand in July 2018. Many of the owners that check their tyres most regularly have: (i) a Tyre Pressure Monitoring System (TPMS ) on their dashboard or receive a similar warning signal through LeafSpy; (ii) have set up routine tyre checks, and (iii) are particularly aware of how tyre pressure can affect range, road grip, and tyre longevity. Examples of comments include “I have a reading available on my dashboard”; “Sunday is car check day!”; and “Knowing the importance of increased drag from under-inflated tyres on reducing EV range”. For one respondent, a known slow leak keeps them on their toes and checking daily, while a monthly checker has “been surprised by how they often need inflating a little depending on the weather”. Several are conscious of the fact that “there is no spare tyre in the car” and this fear drives monthly checks. For others, “memory” is sparked and “whim” moments are enough to keep up the monthly checks. It’s good to know Flip the Fleet is helping up the pressure ante for some of you! “I read your discussion article that pointed to tyre pressure being an important factor in optimising the performance of an EV. I have found that in 1 month the pressure drops by 3-4 PSI, so I top up the pressure monthly”. This person will have been responding to our small survey of Dunedin EV tyre pressures that was conducted during a community experiment to test the effects of load on efficiency (https://flipthefleet.org/2017/many-us-inflated-tyres/). Drivers who checked tyres just “a few times a year” and “once a year” relied more on random thoughts and on chance times becoming available to check their tyres. Many are more likely to check tyres before going on a long trip. Additional indicators that lead to pump-up action include “visible squish” of the tyres, a “go by feel and decide from there” approach, or a “change in season temperatures”. Two owners had filled their tyres “with nitrogen which holds the pressure better than air”. This may well be true but we don’t know of any peer-reviewed, scientific evidence to suggest a benefit in doing so. “Never” responders mostly relied on their service providers or TPMS to ensure tyre pressure remained adequate. One even managed to merge the two! “There is a flat tyre indicator – I do it when it tells me – the car is “the mechanic” in this case”. Do EV owners check their tyres more than ICV owners? Frequency of tyre checking hadn’t changed since switching from a conventional combustion vehicle (ICV) to an EV for 60% of participants (Figure 2). However, more than three times of the remainder increased the frequency of checking tyres compared to those that check their EV’s tyres less frequently than they used to when they owned an ICV. Amongst the ‘Other’ responses (3%), some hadn’t owned their EV long enough to be sure: “Only had car over 1 month. Not checked tyre pressure yet”. Figure.2 Changes in frequency of tyre checks for electric vehicles compared to Internal Combustion Vehicles (ICVs). Percentages are based on 346 choices to Question C, July 2018. Comments suggest that many EV owners apply the “same principles as any car”, although some admit they are consistently “still slack” and others noted there were “more reminders visiting petrol stations and seeing the air filling stations” which made it easier to remember to check air pressure. Some check their tyres “about the same, though [I] recognise that tyre pressure has a greater bearing on efficiency”. This suggests that some owners lack motivation rather than education to follow best practice. Many EV owners place considerable trust in the onboard instruments that warn them when they need to inflate the tyres. These Tyre Pressure Monitoring Systems (TPMS) make frequency irrelevant: “It is done as required by the car” because the instruments warn when additional air is required. Others said: “Yes, I only probably checked my tyre pressure twice a year, if that. I only did it if I thought the tyres looked a bit down. Leaf Spy has changed all that. It is so easy now because of the prompt if the tyres go below my set pressure”; “Yes. It is the first time I have had a car with TPMS”; “the TPMS changes my tyre management “from a casual look to actual gauging”; and “Now there is no need to check, as car should indicate”. Range anxiety and a wish to reduce wear and tear motivate some EV owners to increase their frequency of checking tyres: “I probably check it more because I know we would get more range on properly inflated tyres”; “Yes. I have less mileage with my battery range and I like to maximise it. I was less inclined to keep my tyre pressure checked with petrol vehicle I guess I didn’t think about so much!”; and to “reduce wear and tear”. Range has, however, also featured as a reason for checking tyre pressure less often in EVs: “Yes, it got worse – with our ICE, at least, I checked before road trips. Now we’re really bad...”. Many owners transfer most of their local travel to an EV and use their second car, an ICV, for the longer trips (https://flipthefleet.org/2018/1-click-survey-20/). As some are far less worried about the effect of tyre pressure on these shorter trips, the EV tyres tend to be neglected: “Yes, haven’t had to check yet and won’t be able to do any long trips due to the range of the car”. New EV owners showed a similar mixed response, with one checking “Less as I have more confidence in a newer car”, while another’s checks were “much more frequent, especially as the car is less than a year old”. What were your thoughts on the ideal tyre pressure? Most tend to agree with following the manufacturer guidelines: “Nissan states 36 psi and they know best since they designed it – why risk sliding in slippery conditions for the gain of a couple of kms?”. The door panel and “owner’s manual” were both ports of call for finding tyre pressure information. Taking into account opinions around tyre pressure and driving efficiency, some participants still couldn’t be swayed: “Door sticker 250/2.5 (35psi). Aware of lots of debate but decided to stick with manufacturers recommendation”; “Manufacturers specs. I prefer a slightly softer ride being in Christchurch with our munted roads. It’s kinder on me and my suspension”. Several EV owners use the manufacturer’s recommendations as a starting point, but then pump the tyres anywhere between 1 and 5 psi higher: “I go by the book and add a couple of psi. Harder ride but lower rolling resistance and less tire wear. I usually set it to about 40psi in summer”; “rule of thumb is 2 psi above the recommended values. NZ’s coarse-chip roads require a higher pressure”; “5 psi above recommended to give time between refills and to increase efficiency”. A handful of owners have decided to max out, going with “maximum pressure written on tyre (44Psi)”. Beware a burst! Others have determined their own ‘max’ through trial and error to find their efficiency-safety sweet spot: “Always run around 45psi. Max I can go without causing it to be slippery in the wet”. Online research helps many owners to decide what pressure to use. Participants look up online manuals, consult EV blogs, interact with Facebook forums, Google for answers and delve into the depths of YouTube: “I watched a YouTube which showed the way to work out what pressure to use”; “Web searched. Included weight factor. Picked 42-45. Noticeably better efficiency in summer”; “I forget so ask Facebook”. Trial and error, habitual inflation levels, implementing in-person pressure advice, and mixed method approaches rounded out responses. Some found clarity in consulting various information sources: “Manufacturer’s recommendation, adjusted for Internet wisdom & wear observations”; “Some combination of internet opinion moderated by what I think is safe”; “Manufacturer recommendation and experience combined”; “Manufacturer plus NZ EV Facebook discussion”, while others encountered uncertainty: “Advice, BUT EV mechanics advise 40 psi and tyre mechanics advise 32-34 psi”; “I will usually add a couple pf Psi though knowing that it drops with time – also a US blog I read had people pumping them way over (up to 42 psi) to get improved efficiency (reduced rolling resistance). I would like to know if this is safe”. Just under half (46%) of responders knew which specific brand of tyres they had on their EV (155 of 336 responses, Figure 3). For those that did not know the brand, 7% of all responders mentioned “eco” or “low rolling resistance” as a key tyre feature, while another 22% stated they didn’t know because they were still using the original or factory-fitted tyres that came with the EV at purchase. The remaining 24% were unsure of the brand of tyres on their EV, and did not provide any further information. Figure.3 Types of tyres fitted to electric vehicles in New Zealand. The percentages are calculated from 336 responses to Question D, July 2018. The presence of original tyres among the fleet was highlighted in the final survey question about the deciding factor when choosing a tyre brand (Figure 4). Most participants stated that they hadn’t had to change tyres yet (69%). 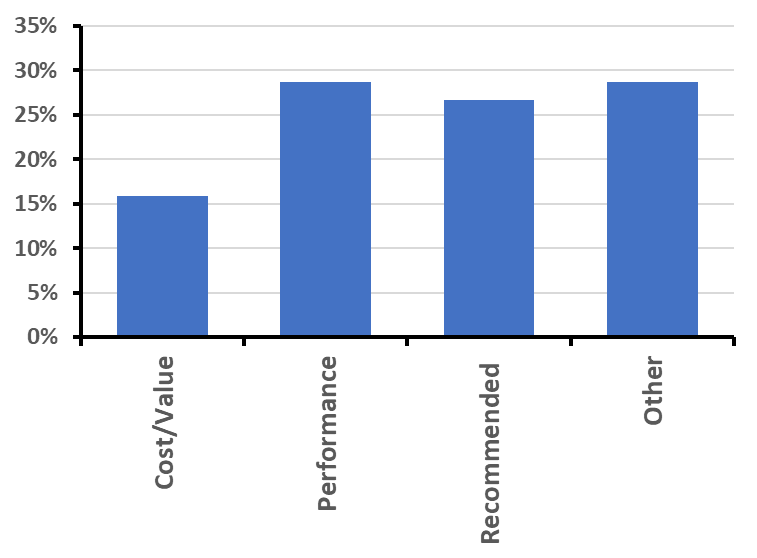 Amongst the remaining 101 responses, while those that had needed to replace tyres were driven by performance, recommendations of the manufacturer, and to a lesser extent the cost or perceived value (Figure 4). ‘Other’ reasons for choosing a certain brand included loyalty to a favoured brand: “Have always run Bridgestone tyres on all my cars”; “Default to existing status quo”, while some just wanted tyres that did the job: “I have no preference for tyres, except I prefer unpunctured ones…”. The remaining Other responses included “Not applicable”, or leaned towards the decision being an externalised one: “I did not choose”; “I have not selected it”; “previous owner”. Amongst the half (46%) of you who knew the brand of tyre currently on your EV, most had Bridgestone (stated in 90 responses) tyres, with Dunlop (19 responses), Goodyear (15 responses) and Michelin (13 responses) being less common. The remaining 12% of known brands included Haida (1), Kumho (3), Firestone (1), GT (1), Nitto (1), Nexen (1), Toyo (2), Continental Contisport (1), HiFly (1), Yokohama (3), and Sunfull (1). Many respondents expressed little interest in the type of tyre they run, or were unable to check at the time of the survey: “Round ones (came with car too lazy to check)”; “The ones that came with it (it’s raining, sorry! )”; “Can’t respond – away from home”; “Factory 2011 tyres from Japan. No idea what they are. They pass WOF, who cares”. As 69% of participants are still on their original tyres, many have not yet had to confront the choice of what to replace them with. e.g. “UK fitted, never looked”; “Manufacturers recommended – haven’t changed tyres yet from new – 40 000kms and counting. Some have replaced half of the original tyres or are contemplating a tyre change soon: “Original Nissan Leaf 2016 on the back, energy efficient Goodyear Assurance front”; “We just put 2 Sunfull tyres on the front recently”; “Came with Dunlop Enasave EC300. But likely to change to Bridgestone Ecopia soon”. 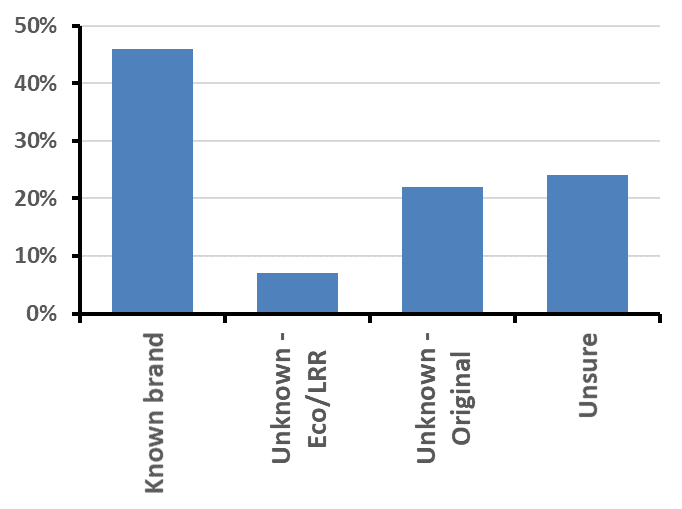 Even if exact brand wasn’t known, 7% of participants showed umbrella knowledge of desirable tyre properties, giving statements like: “some sort of eco tyres or better”. “Low rolling resistance” also featured several times, with one survey responder planning to “change to all low [rolling] resistance at next renewal”. So even if the brand evaded people’s memories, they picked up on the efficiency, and environmentally conscious aspects of their tyres. For the remaining 24% who were unsure of the brand of tyres on their EV, feedback didn’t extend far beyond “good ones”, “standard” ones, and “Black ones, inflatable, made of rubber”. Interesting enough, 80% of those responding with Unsure to the tyre brand question checked their own tyres ‘A few times a year’ or less often. Figure 4. Reasons governing the choice of tyres fitted to New Zealand electric vehicles. 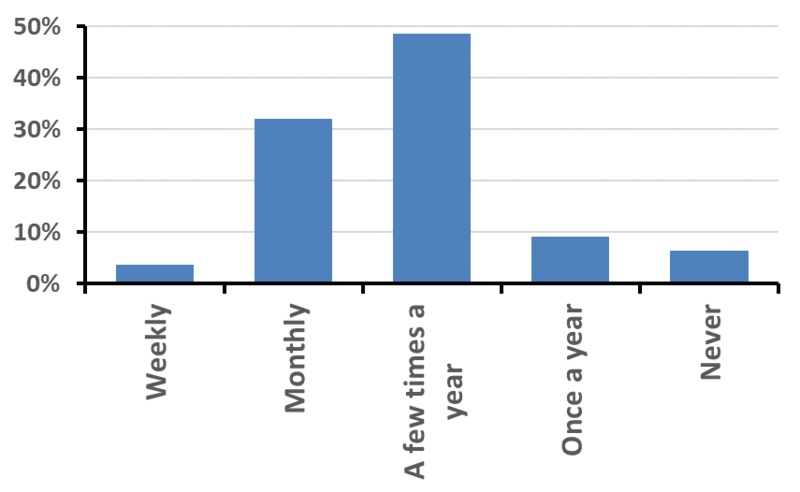 Percentages are based on 101 categorisations of responses to open Question E after exclusion of 228 respondents who were still using the tyres that came with the EV at purchase, July 2018. Factors most affecting new tyre choice included perceived value for money: “Value (mileage vs price)”; “Price. Some eco tires OTT with pricing”; “I never buy the cheapest ones”, along with tyre performance attributes: “Balance between grip and low rolling resistance”; “Durability and quiet tread design”, and whatever was recommended by those in the know: “Mechanic said they were as good as Ecopia for half the price”; “EV forum recommendations”; “International reviews”. With so few of you having to make these decisions to date, it will be interesting to see if one of the above factors begins to edge away from the others in the future. Some EV owners that are still running on the original tyres are already thinking ahead and forecasted their preferred tyre options in their responses – that’s great! When it comes time to replace, these participants will “opt for “fuel-saver” tyres, since I have found them to be extremely effective on my petrol car”; “get good quality tyres. I never bothered with my old petrol car because it was on its last legs so I just got cheap tyres”, and base decisions upon “lowest rolling resistance that gives the safest ride”. One participant is very well prepared for their pending replacement: “Have some eco tyres to try next – Hankook Nanotech 3 which I scored cheap off Trademe. Same size as current tyres. Will also fit on lighter rims though”. Some owners plan to stick to the same tyre out of habit, trust, or brand loyalty: “Have always run Bridgestone tyres on all my cars”; “I wanted original tyres as I assumed they might be designed to maximise efficiency”; “likely to keep with brand/type as at 58,000 km they still have good tread”. Others wanted to mix it up a bit now that their vehicle purpose and priorities had changed: “Next tyres won’t consider rolling resistance since range is not a consideration. Instead I will go for safety, longevity and quiet”; “According to MacFarlane’s Tyre Centre, snow tyres are hard to get and more expensive, so they fitted low-rolling resistance tyres instead (Goodyear Assurance TripleMax 205/55 R16). They predict a noticeable rise in energy efficiency. It is very noticeable that the car is much quieter on the road – there is way less wheel rumble”. We’ve got to say, this comment kind of made our day: “New tyres were already on the car when bought, but I got them aligned just in case not done already”. Now that’s attention to detail! Why is tyre pressure important? Government, industry, online, and academic resources all highlight the importance of keeping tyres pumped and primed to increase maximum range, save on fuel, and preserve tread for both ICVs and EVs (Table 1). For example, one commentator stated: “Underinflated tires decrease fuel economy, shorten tread life, have less lateral traction and longer stopping distances, are prone to stress damage, and are more vulnerable to flat tires – all of which increase the risk of vehicle accidents/rollovers.”1 The studies vary considerably in their predictions of the size of loss in efficiency from low tyre pressure – in one study a 17% increase in fuel consumption is predicted from extremely underinflated tyres. Increased load increases the penalty on efficiency. It is also important to keep the tyres well-aligned and to rotate the tyre positions to even out wear. Having the right tyre pressure is also important for your safety because braking distances are extended if the tyres are flat, especially in wet weather. Table 1: Reasons for maintaining correctly inflated and well-aligned tyres. Sources of this information are listed in the reference section at the end of this report. Correct inflation promotes efficient and safe motoring in all vehicle types, but it is particularly important for EVs because it allows you to achieve your maximum range and overcome “range anxiety” (Table 1). Justin Edgington, Training and Business Development Manager for Tyreline, kindly shared the below graphic with us. It shows the effect of low tyre pressure on braking distance, fuel efficiency and tyre wear and tear by comparing tyres pumped to 35 psi with those progressively underinflated (32, 28 and 25 psi)3. Of interest is the headline “You can’t tell by looking”, which may speak to those who stated they look for “visible squish” as a cue to pump up your tyres. Justin Edgington also commented on the equal risks associated with tyre over inflation: “It is a known fact that over inflated tyres are more prone to damage, punctures and offer less grip in all conditions. Tyres that are already overinflated increase in pressure when in use to way beyond the manufacturers pressure which is not safe”. Bill Prebble, Head of Technical and Product at Goodyear Dunlop Tyres NZ, also cautions people using tyre pressures above 40 psi, which some of you stated was your current efficiency optimisation tactic: “at higher tyre pressures, the enveloping power of the tread and belt package is reduced, making tyres more vulnerable to damage by impact and more liable to punctures. Additionally, because high tyre pressures alter the steering response and lateral grip curves, drivers may find tyre performance less predictable when higher grip levels are called for, such as in evasive or emergency situations”. In fact, Justin Edgington quite rightly pointed out that maintaining tyre pressure within the manufacturer’s guidelines is a legal requirement in New Zealand:“NZ roads laws say that the tyres must be inflated as per the manufacturers (vehicle) recommendation. We are aware that most NZ motorists are unaware of this law”. Rotating tyres from front to back or side to side is another aspect of tyre care that can prolong their safe driveable life (see Table 1). Bill Prebble and Justin Edgington both agree that although “technically there is no essential reason to rotate if all tyres are wearing evenly”, one might consider doing as part of an economically viable tyre maintenance plan. Bill notes that: “If all tyres are wearing uniformly, then the decision to rotate or not is often decided based on whether the consumer wants to replace tyres in pairs or full sets of four, so the decision is often generated by economics / personal affordability”. According to Justin, tyre “rotations should be carried out whenever an abnormal pattern develops on the tyres – conditions such as saw tooth wear and heel and toe wear along with feathering or scaling all indicate it’s time to rotate. Sloped wear and other visible signs can show the drivers that attention is needed. On some vehicles you can even hear an acoustic hum and in extreme cases a vibration can develop if a rotation is needed”. Bill adds that “while tyre rotation may “even out” some of the irregular wear, it is important to understand and rectify the root cause, and thereby extend the mileage potential of future replacement tyres”. So how do we know when the time is right for rotating the tyres? A problem Justin Edgington has identified is “that our industry simply applies an arbitrary time or mileage (typically 10,000 kms) whereas in fact it depends on the type of vehicle, vehicle settings and geometry, power, drivetrain, use, power and individual driving style, all of which differ for everyone. Therefore, it is foolish to suggest a timescale when irreparable damage can be done way before the rotation becomes due”. He uses “New Zealand’s most popular vehicle”, the Ford Ranger as the example, stating: “they generally need a rotation in as little as 3000-5000kms depending on the use and geography”. However, “if regular rotations are undertaken, huge increases in potential tyre mileage can be achieved”. Given that many other car elements have rapidly progressed yet the tyre recommendations have not changed it’s time for some education and training programmes to update people’s practices and recommendations. Are we taking technology for granted? Neglect of tyres may be part of a much bigger problem of people just taking modern technology for granted. While modern cars of all sorts require much less maintenance than older cars, an EV with its reduced working parts and highly complex electronic monitoring systems may be encouraging a more lax view on (tyre) maintenance displayed by Flip the Fleet survey responders. Certainly, the survey showed that many owners are pretty oblivious about their tyres. 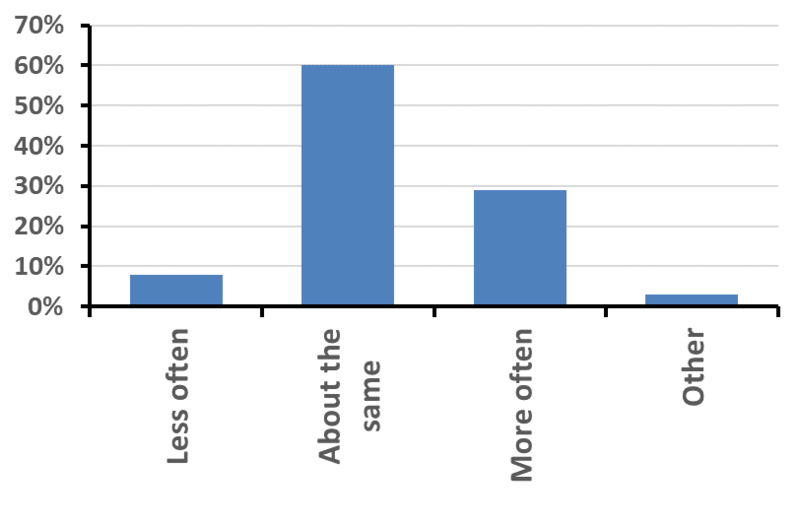 When asked what sort of tyres they used or preferred, many couldn’t say. Others answered “round ones”, “black ones” and “ones without a puncture”. Some replied “who cares” or admitted that “pure laziness” prevented them from checking their tyres often enough. But smarter owners realised the importance of the tyres for vehicle efficiency and targeted low rolling resistance brands. As for those using their TPMS as the ‘be all and end all’ for receiving alerts, Justin Edgington cautions against sole reliance on this technology for maintaining optimum tyre pressure. In line with Bill Prebble’s advice, Justin recommends even with TPMS to check tyres monthly. “TPMS systems are not infallible either so to keep safe, check tyres regularly”. Are many EVs driven on under-inflated tyres? According to Bill Prebble, “while tyre maintenance on internal combustion vehicles is important, the maintenance and selection of tyres on EV’s is critical to the safe and efficient performance of the vehicle”. We shared results from this 1-Click survey question with Bill, who suggested that “the [Flip the Fleet] respondents are better [at checking their tyres] than the average New Zealander by far”. This is encouraging and it fits with the results in Figure 2 that show around a third of EV owners now check tyres more often! But there is still quite a way to go before our tyre care is up to scratch. Best practice is to check and adjust tyre pressure every month, and according to our 1-Click survey, only a third of EV owners currently meet this recommendation. There are few studies that report the average levels of inflation on cars in service in New Zealand. However, tyre pressure is known to gradually decrease at around 1 to 2 psi per month if left unattended (https://www.energywise.govt.nz/on-the-road/tyre-pressure/). Our survey suggests that around two thirds of owners check their tyres no more often than once every six months or even less. Some of the more aware owners inflate their tyres slightly above recommended levels when they do check, so we do not expect that the full two thirds of tyres will be underinflated, but many will be. A recent but small survey of Dunedin EV owners confirms this concern – around half (54%) of the tyres on 19 Leafs that took part in Flip the Fleet’s efficiency experiment on 25 November were inflated below the recommended ‘cold tyre’ pressure of 36 psi (https://flipthefleet.org/2017/many-us-inflated-tyres/). One of those tyres had a pressure of 25 psi, around 30% less than recommended. There is a need for a much larger and systematic study of tyre pressures used by EV owners before the prevalence of under-inflated tyres can be better quantified. Bill Prebble reports that the last systematic studies of tyre pressures in New Zealand were conducted in the early 1990s and so are unlikely to still apply. In the meantime our preliminary survey suggests real cause for concern and highlights the value of more educational campaigns to improve owner practices. The material provided by EECA’s ‘Energywise’ website, and other websites cited in the reference list below is excellent, but clearly it is not getting through to many vehicle owners. Infrequent checking of tyres may be less about participant knowledge of tyre pressure benefits and more about mustering the motivation to check: “The Dunedin EV group checked tyre pressures at the start of one of our community experiments and found a lot were way lower than recommended – but even with that wake-up call (last November) I haven’t increased my checking frequency”. There is a clear need to raise awareness and encourage routine and habitual checking as a normal part of EV maintenance. Overall then, participants commonly seek pressures between 35 and 45 psi. Industry advice directs EV owners to stick to recommended tyre pressure or at most, go 2 psi above this amount, but some greatly exceed these guidelines. We strongly recommend that this practice stops. Many New Zealanders are still coasting along on their original EV tyres. The kilometres travelled in New Zealand will soon stack up and the earliest model Leafs (2011) are still being imported, with increasing miles travelled and their original tyres fitted. Overall, responses to our questions highlight just how young our EV fleet is. Looming large scale tyre turnover is something we should all be aware of and begin preparing for. It also means now is a great time for Flip the Fleet and others to get some useful tyre information out and about! We’ve made a start in the recommendations section below. Tyre pressure checks and adjustments currently aren’t high enough on our priority list, with many leaving it up to memory or whim, tyre misshape, a sub-par driving experience, or their next service check to trigger action. Our survey suggests that many EV owners have under-inflated tyres. We urge you to follow the recommendations in Table 2 – your car, tyres, wallet and environment will thank you for it! 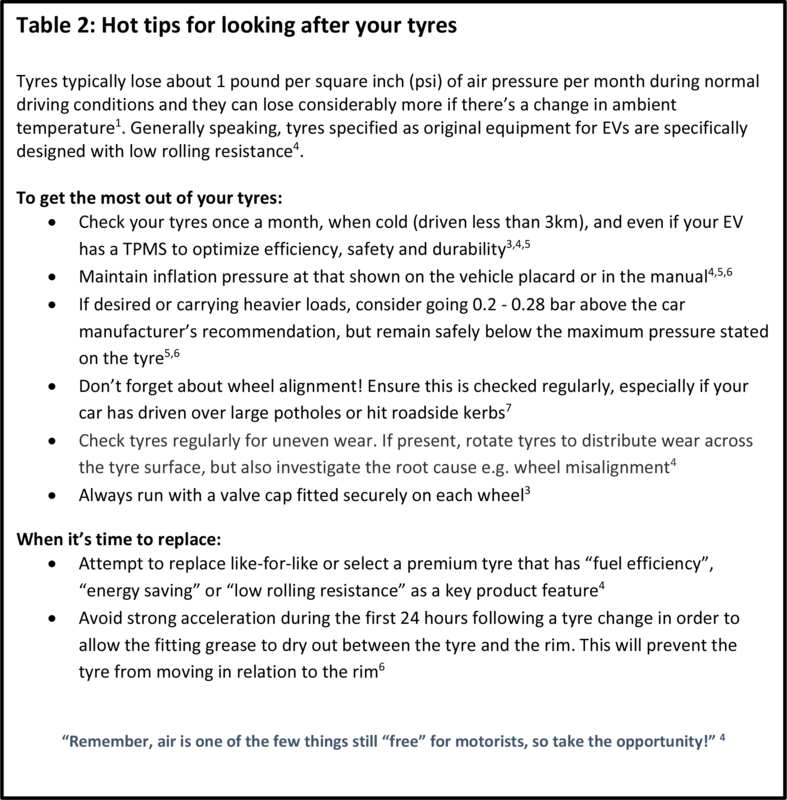 A national educational campaign including guidelines for buying new tyres and tips for taking care of them is important for all makes of car, but particularly valuable for owners of the smaller and earlier EV models where efficiency and range maximisation are sometimes more important than in their ICV counterparts. Tyres are expensive, environmentally toxic to make, run (they give off minute fragments as they wear) and dispose of, so there are good community reasons for making them last as long as possible. Below is a lightly edited and re-arranged selection of many of the comments received. Simple: when the tyre looks flat! “I’ve been surprised by how they often need inflating a little depending on the weather” • “If it’s crappy weather I check the pressures” • “when the weather turns nasty and I have to drive” • “When the weather gets frosty” • “Change in season/temperature” x6 similar responses. When it’s Flip the Fleet upload time! I stuck with what works! 1 Pearce, J.M., Hanlon, J.T. (2007). “Energy Conservation From Systematic Tire Pressure Regulation”. Energy Policy, 35(4), pp. 2673­2677. 2 Oduro, S., Alhassan, T., Owusu-Ansah, P., Andoh, P. (2013). 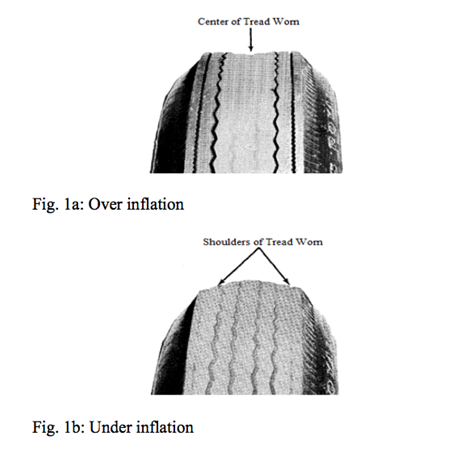 A Mathematical Model for Predicting the Effects of Tyre Pressure on Fuel Consumption. Research Journal of Applied Sciences, Engineering and Technology. 6. 123-129. 10.19026/rjaset.6.4046. 3 Provided by Justin Edgington, Training & Business Development Manager (Group), Tyreline. 8 Schuring, D.J. and Futamura, S. (1990). Rolling loss of pneumatic high-way tire in the eighties. Rubber Chem. Technol., 63(3): 315-367. 10 Hadrys D, Wegrzyn T, Miros M. (2008). The Influence of various pressures in pneumatic tire on braking process of car with anti-lock braking system. in Transport Problems, 2008. 11 Besselink, I. J. M., Schmeitz, A. J. C., & Pacejka, H. B. (2010). An improved Magic Formula/Swift tyre model that can handle inflation pressure changes. Vehicle System Dynamics, 48(S1), 337-352. 14 Savitski, D., Hoepping, K., Ivanov, V., & Augsburg, K. (2015). Influence of the tire inflation pressure variation on braking efficiency and driving comfort of full electric vehicle with continuous anti-lock braking system. SAE International Journal of Passenger Cars-Mechanical Systems, 8(2015-01-0643), 460-467. 15 Redrouthu, B.M., Das, S. (2014). Tyre modelling for rolling resistance. Department of Applied Mechanics Division of Vehicle Engineering and Autonomous System Chalmers University of Technology. Masters Thesis 2014:24 ISSN 1652-8557. SE-412 96, Göteborg, Sweden. Test your tyre knowledge with their 20-question quiz! We would like to express our utmost appreciation for the contributions made by Bill Prebble and Justin Edgington for teir peer review of this 21st Flip the Fleet 1-Click survey and blog. Your knowledge is amazing and you gave generously of your time. A hearty thanks to you both! Justin Edgington has kindly agreed for you to personally get in touch should you have any further tyre-related questions or queries. This survey reminded us how slack we’ve been – so now intend checking tyre pressure at least once a month. I’ve had my Renault Zoe for 4,5 years now. The tyres have now done 43 000 km, and I’ve run into a problem with the steering moving left and right at very low speed. I’ve been to two garages and they both recommended I replace the tyres, they all show wear on the outer sides of all the tyres. I’ve kept them at the recommended 250 kPa with my own compressor. I’ve read a couple of blogs that suggest this is a common Zoe problem, so I’ve decided to increase the pressure to 275 kPa and see what the wear pattern is. The tyres still had about 3 mm of tread depth remaining, probably good for another 15 000 km until the wear limit was reached.